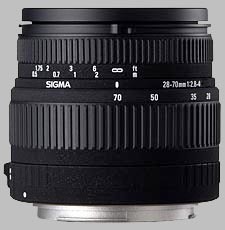 (From Sigma lens literature) This standard zoom lens covers focal lengths from 28mm to 70mm with a minimum focusing distance of 50cm (19.7 inches) and a maximum magnification ratio of 1:6.5. The minimum shooting distance is 0.5m (19.7 in.) throughout the zoom range. An aspherical lens element is used to correct distortion. A zoom hood is supplied with this lens for complete depth in the telephoto range and glare-free shooting in the wide-angle range. Ok it's a cheap lens.You get what you pay for. Built quality is very bad. A lot of problems with flare and ghosting, CA on a high level, barrel distortion at the wide end, light falloff wide open (untill f11), sharp only stopped down 2 stop. Replaced this with the Canon EF 28-135 due to softness all over and a general lack of contrast. The colors from this lens always looked washed out. One advantage is it is very light weight.